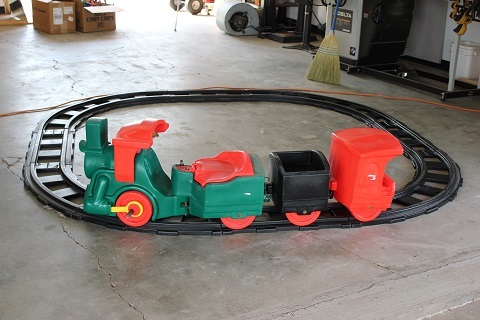 Here is the Little Tikes ride on train that Sandra and I inherited. It is in incredible condition considering it has been in an open attic for 25 years or so. The plastic is not brittle or faded and as you can see all of the set is complete. A cursory test of the motor and the whistle proved everything still worked. So we have cleaned it up and I am doing some very light maintenance on it. I washed the whole set with mild soap and cool water and let it dry in the shade. Next was the drive train. Since it was obviously made to be maintained, I opened the transmission and cleaned out all the old white grease. This will be replaced with fresh white grease and reassembled as is. 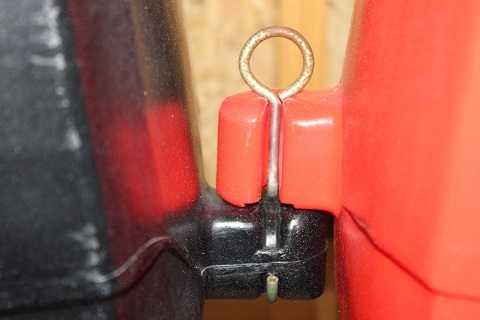 The only parts in question at this stage are the electrical connections. The motor works and the whistle blows when power is applied, but I'm not sure the little connector board is going to make good contact. We may have to make some modifications. It has amazed us that since we posted this little bit of information on this train the flood of emails that we receive. About 9 of every 10 emails or comments we receive from the website have nothing to do with our display at all. Its mostly about this train set. We are NOT the end all guru's on this train, but we will pass along what we can. As we learn and experiment, we will try to keep this up to date. Q. WHAT KIND OF BATTERY DOES THIS TRAIN USE? A. 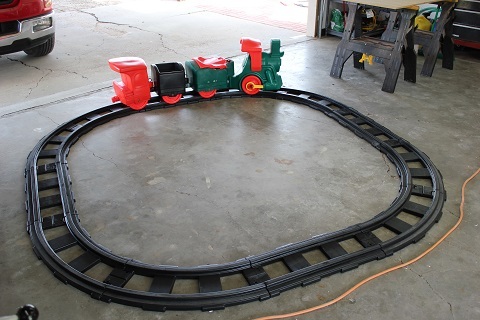 This particular train set uses a 6 Volt battery located under riders seat. I don't know if later models used a 12V battery or not. Q. WHERE CAN I GET A BATTERY? A. We actually haven't purchased a battery yet. However, it looks like there is a 6V Electric Fence battery available from Tractor Supply (Click Here). I've seen it at our Tractor Supply and the physical size appears right and at 14AmpHR it should be enough to tote the toddlers. I have also seen a 6V Power Wheels battery at Wal-Mart that appear to be the right size. Not sure about its rating. I think it may be a little low. Q. DOES/CAN/WILL LITTLE TIKES ................................... ? A. Nope. They will answer their phone.. that's about it. Q. MY <fill in the blank> IS BROKEN. 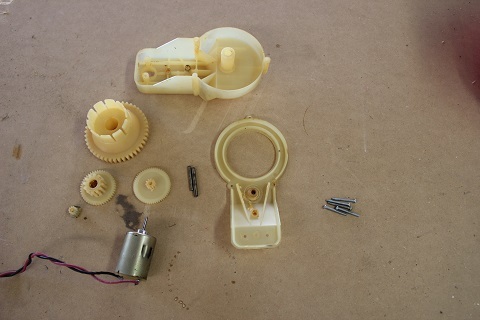 DO YOU KNOW WHERE TO GET PARTS? A. Unfortunately ... no... Little Tykes, while still in business, has discontinued this toy and has disavowed itself of anything to do with it. At least keep the documentation available ... sheeesh... My best suggestion for parts is to keep an eye out at garage sales and maybe even Ebay. Q. "I HAD ONE OF THESE WHEN I WAS A KID AND I WOULD LIKE TO GET ONE FOR MY son/daughter/grandchild... IS YOURS FOR SALE? Here is the transmission open. I am amazed at the beefiness of the gears and drive hub. I've said it once and I'll say it again. They just don't build toys like this anymore. Sandra and I have received a question about how these cars connect. 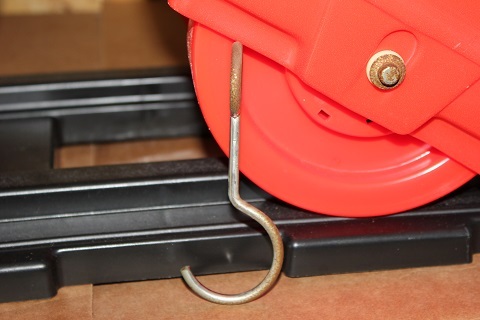 So to hopefully benefit everyone that visits our site we have posted this additional section to show the connection and the hook that ties them together. 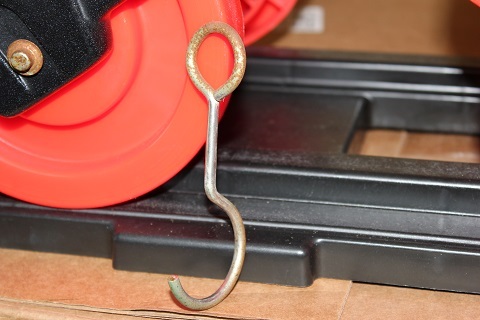 If you have lost or never had the hooks they could be made fairly easily. 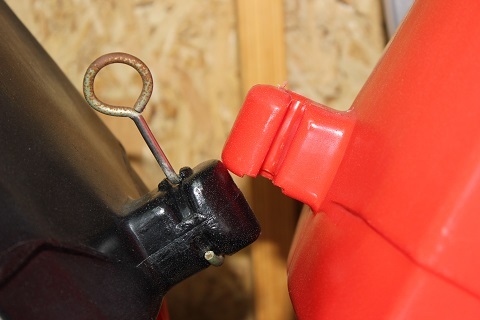 If thats out of your reach, they could be held together with a zip tie or a hose clamp even. Here the cars are uncoupled. I did rotate the hook connector back up for clarity. Finally, here is the connector from a side view.